You must be 25 years old to rent this house! If you love to fish, collect shells, sun bathe, swim, bird watch, dolphin watch, take long walks, or just lay on a beach chair, our Grace on Fort Morgan beach is the place for you. 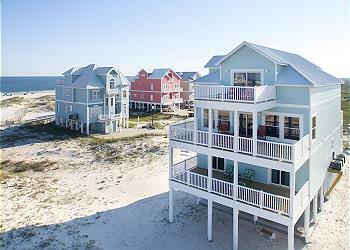 Bring your family for a wonderful vacation at this beautiful BRAND NEW beach house in Fort Morgan. Located just 20 minutes from Gulf Shores. The location is hard to beat. Beautiful white sandy beaches without all the crowds. This beautiful home is a three-story getaway, complete with everything you'll need to relax and enjoy a carefree vacation at the beach. From the second you arrive, you'll feel like you're at home. The views are spectacular!! Dream kitchen with custom cabinetry, granite and stainless. This house does have an elevator for your convenience. The first floor is home to 4 bedrooms each with a flat- screen tv, a dvd player, and a private full bath, one of which is wheelchair accessible with a roll-in shower and sink. All bedrooms have great views of the Gulf and lead to spacious decks. Each bedroom is a king or queen with the exception of the children's room, which has 2 bunk beds with lower and upper double beds. The second floor is where you'll spend most of your time because it's where everyone hangs out. There is a Dream kitchen with custom cabinetry, granite and stainless, two refrigerators, 2 microwaves, 2 dishwashers and a commercial ice machine. You can sit out on the expansive deck with beach views or watch TV on the large flat screen in the living room or study. The study has a queen-sized sleeper sofa and access to a full bath. The third level has 2 master suites, each with a king-size bed, a beautiful bathroom, a flat screen tv, a dvd player, and a private deck. Other features of this home include: outdoor grill, fully stocked kitchen, abundant parking, wifi, and many additional items which you will observe. This home is in a quiet community located on the south side of fort Morgan road. Bon Secour National Wildlife Refuge is located about 6 miles East on Ft. Morgan Rd. About 1/4 mile from the home is Gulf Shores Yacht Club & Marina offering charter fishing, dolphin and sightseeing cruises, and Jet Ski rentals. Tacky Jacks II restaurant and bar are also located at the Marina. Fort Morgan is a historic fort at the mouth of Mobile Bay which is located only one mile from the house. Some regard it as 'one of the finest examples of military architecture in the New World. The post was named in honor of Revolutionary War hero Daniel Morgan. Construction was completed in 1834 and it received its first garrison in March of the same year. There is a car ferry only a mile from the house that will take you across the bay to Dolphin Island where you will be able to explore Ft. Gains. There are exhibits which include the huge anchor from the USS Hartford, Admiral David Farragut's flagship on which he gave his world famous command, 'Damn the torpedoes - full speed ahead!' The fort also has the original cannons used in the battle; also an excellent museum that details the history of this period. It is an important tourist destination with tours and historical reenactment events. The site has been nominated for listing as a National Historic Landmark. You will also enjoy the Estuarium! This is an exciting educational sea lab facility which includes a living marsh boardwalk. The estuarium is also a showcase of the plants, animals, and other natural resources found in the estuary and its surrounding marine habitats. This is the fourth largest estuary system in the United States. "We loved the place! Having two of each kitchen appliance was great. We made good use of the ice maker and really appreciated having the fully stocked kitchen and game selection. The furnishings are gorgeous. The deck furniture is sturdy and beautiful. The views are spectacular. We would definitely want to come back. " "Very nice, clean house with great views of the beach. Only complaint is that I would recommend that someone fix the boardwalk to the beach. Lots of warped and rotted out boards. I'm afraid someone could get hurt if not fixed. " "Beautiful, new beach home in a great location. Beach was not very crowded. Lots of other families enjoying the same thing as us." "I would definitely consider staying here again. The property was clean and in a quiet neighborhood. The beach and pool were easy to access. We absolutely loved the balcony view. " "We had a wonderful time in Fort Morgan and staying at Grace was a highlight of our vacation. Great home for a large family......the only suggestion would be to include the sports channels on the TV." "10 girlfriends about to turn 60 met up after 40 plus years apart and relived our high school days in this amazing beach home. We had a fun filled week full of laughter, reminiscing, sharing hugs and tears while in the comfort of this spacious and well equipped beach house. The views were even better than expected. " "Had 8 adults and 5 children (age 3 - 10) and had more than enough space for all of us. The whole house was pretty much perfect. Don't want to be negative at all but because it is a new construction there were a lot of nails in the sand around the house. Had to make sure the kids had shoes when playing outside. Other than that we had a wonderful vacation and would definitely come back." "We had a great week. Really enjoyed everything about it." "This house provided a peaceful wonderful vacation. With its double refrigerators, dishwashers and ovens made cooking and cleanup so quick and easy, leaving a lot more time to visit with family. Best of all an easy walk to a beautiful beach!" "This home is wonderful! Very clean and well maintained - we had 3 families and it was perfect. Home is close to the beach and has amazing views. Definitely would recommend and will be staying there again when we return to Gulf Shores!" "Our family enjoyed Grace for a week during the first of September. There were 19 of us ranging in age from 1 to 86. The home was beautiful and everything in it functioned well. The elevator was a special blessing for my mother to avoid the stairs. We weathered through Tropical Storm Gordon without incident and made some memories we will laugh about for years. The house had plenty of room for everyone to have their own space and was positioned close to the beach for easy access. We would definitely consider Grace again for our family get away! "We were 6 families with 10 kids. The beach access was great. The rooms were good and nicely maintained. The Kitchen was also good. Wifi was slow, and the TV did not work due to internet speed ( we hardly wanted to watch TV). The balcony was good but not covered, had to come inside when it rained. I still recommend as one of the best Beach house." "My family and I had a wonderful time staying in Grace. It is a beautiful home on a beautiful location. There were about 4 drilling ships visible from the beach but that didn’t make the stay any less wonderful. We’ve already rebooked for next year. I will say that the location is about 25 minutes away from other shopping areas but there is a great little grocery story about 10 minutes away. I love this home!!"